Several Armenian sources were used for this study. One primary source is the household count prepared by the Moush Prelacy from 1899,  which was republished in A-Do’s (Hovhannes Ter-Martirosian) brochure in 1912. Another primary source is the household-and-population count prepared by the secretary of the Prelacy, Nazaret Martirosian, published in a statistical table in 1916 in the periodical Van-Tosp. The data from A-Do’s brochure were initially supplied by Nazaret Martirosian, who later, between 1913 and 1915, updated the data. Four other relevant sources are the last of a three-volume travel guide published in 1885 by ethnographer Manuel Mirakhorian,  the article “Bulanik” written by Atrpet (Sargis Mubayeajian) and published in 1915 in the periodical Mshak,  the book about the sufferings of Armenian clergymen written in 1921 by Teodik (Teotoros Lapçinciyan),  and the census data drawn up by the Armenian Patriarchate of Constantinople in 1913 – 1914. The census data can be found in two sources: Kévorkian and Paboudjian’s account on Armenians in the Ottoman Empire,  as well as Kévorkian’s complete history of the genocide. In 2012, the National Archives of Armenia published a landmark record of the collection of documents, in which a number of witness accounts contain important demographic data. “Dictionary of Place Names of Armenia and Adjacent Territories” by eminent authors Tadevos Hakobyan, Stepan Melik-Bakhshyan and Hovhannes Barseghyan, supplied additional data. Index Anatolicus, an online database of Armenian place names in Turkey created by Sevan Nishanyan, helped identify the locations of the Bulanik villages. Population figures from the 1308 (1892) Bitlis "salname"
3. Marcel Léart (alias Krikor Zohrab), La question Armenienne a la lumière des documents [The Armenian Question in the Light of the Documents], Paris, Augustin Challamel, 1913. 4. H.F.B. Lynch, Armenia: Travels and Studies, volume 2: The Turkish Provinces, London, New York, Longmans, Green, & Co., 1901. Ottoman government censuses also contain statistics on the Armenian population in the region. A census carried out by the Patriarchate prior to World War I produced a figure of 25,053 for the Armenian population in Bulanik; the Ottoman census placed the number of the Armenian population at 14,662. Significantly, according to Karo Sassouni’s count, the number of Armenians of Bulanik and Manazkert who found refuge in Russian Transcaucasia in July 1915 was estimated to be 34,000. Using solely the pre-WWI Patriarchate figures of 25,053 for Bulanik and 11,931 for Manazkert, the number of Armenians in both counties would be a total of 36,984. On the other hand, if only using Ottoman data for both counties (14,662 and 4,438 for Bulanik and Manazkert, respectively) the number of Armenians would be a total of 19,100. Another Ottoman source indicated that in 1915, the number of Bulanik Armenians who were to be forcibly deported, or as Turkish sources put it, “relocated and distanced,” was recorded in their registries at 14,309. Interestingly, an Armenian accusatory report published in 1918 in Aleppo put the number of survivors from Bulanik and Manazkert at about 25,000. Although a report signed by a group of genocide survivors carries less strength than a census or a count, the figure for the two counties contained in it is still 1.3 times larger than the Ottoman figure of 19,100, while the Armenian figure of 25,053 for Bulanik alone is 1.7 times larger than the Ottoman figure of 14,309 for the same county. Given that most Armenians of Bulanik and Manazkert escaped massacres thanks to the advance of the Russian troops into the region in May of 1915, it can be said that the Patriarchate figure seems to be fairly accurately reported. Armenian sources, however, are not entirely flawless; the numerical discrepancy with respect to households and inhabitants in Bulanik is immediately arresting. This discrepancy is due not only to crude statistical techniques for collecting data at the time, but also to harsh realities on the ground that resulted in frequent undercounting of the Armenian population. In some instances, Kurds would forcibly take over Armenian villages, drive all or part of the Armenian inhabitants out prior to a census operation, or would ban entry to seized villages to Armenian census-takers, as it happened to Bishop Garegin Srvandztiants in the late-1870s. In other instances, Armenian villagers would minimize their household numbers in fear of increased taxation at time when Kurdish chieftains already imposed unbearable incremental taxes on them. Numerical discrepancy notwithstanding, Nazaret Martirosian’s data stand out as the most comprehensive of all sources exploring Armenian population in the region. It should also be noted that, perhaps paradoxically, Armenian sources omit many of the Armenian-inhabited localities in Bulanik. Household counts pose another hurdle for researchers. Most Armenian villagers in Bulanik were of kin to each other, godchildren, or in-laws. Families of married sons, branching and multiplying, transformed into kinsfolk, often changing their original surnames in the process. However, they would customarily maintain close family ties with the next of kin and considered themselves members of household. It is, therefore, hard, if not impossible, to estimate with any degree of accuracy, the average number of household members. Bishop Vahan Ter-Minassian (Partizaktsi), a commissioner at the Patriarchate in the 1860s and 1870s, suggested that the average number of members per household in rural areas should be put at eight, and in urban areas between five and six. Thus, the average number of members per household in Armenian-populated provinces, in his opinion, should be seven. By analogy to Partizaktsi, Mayewski put the average population per household at eight and the number of households per village at twenty for the Bitlis province. Reporting about 8,600 Armenians living in 770 households in Lower Bulanik villages, Atrpet evidently put the average population per household at eleven. Because Bulanik was a rural area, in this study, eight will be used as an average number of members per household. 2. 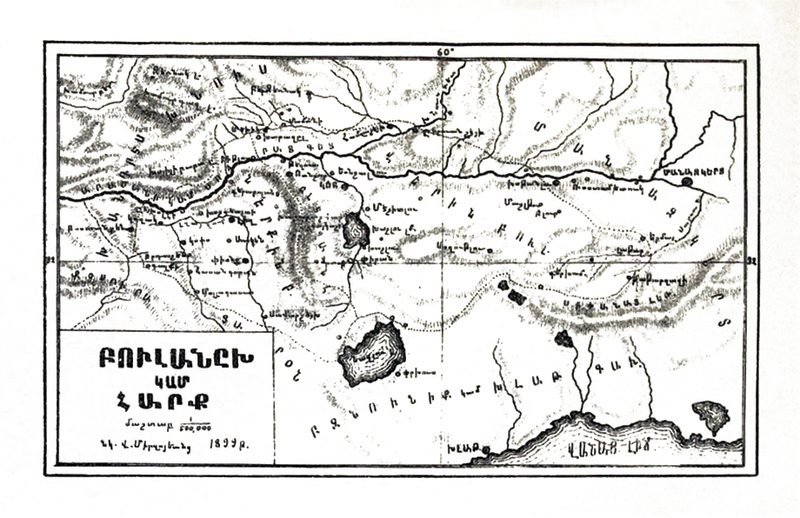 Manuel Mirakhorian, Nkaragrakan oughevorutioun i hayabnak gavars Arevelian Tachkastani [A Descriptive Journey to Armenian-populated Regions of Eastern Turkey], Constantinople, Partizpanian Publishing House, 1885, volume 3. (in Armenian). 3. Vital Cuinet, La Turquie d’Asie: géographie administrative, statistique, descriptive et raisonée de chaque province de l’Asie-Mineure, volume 2, Paris, 1891. 4. A-Do (Hovhannes Ter-Martirosian), Vani, Bitlisi yev Erzroumi Vilayetnere [The Provinces of Van, Bitlis and Erzerum], Yerevan, Tparan Koultoura, 1912. (in Armenian). There is a discrepancy among sources regarding the number of Armenian-inhabited villages in Bulanik. Authors of “Msho ashkhar” (The Land of Moush), an editorial published in the periodical Lumá in the 1890s, suggested that in the late-1870s there were 43 total villages in the county. For the years 1871, 1872 and 1873 this figure matches up to the total for villages in Ottoman salnamés placed at 43, 42 and 46, respectively. A-Do put the number at more than 60, of which 29 (elsewhere in the brochure, 28) were Armenian-inhabited. Philippov reported in the early-1880s that Armenian villages totaled twenty and were quite populous. Mirakhorian identified 26 Armenian villages each having on average about 100 Armenian households. Vital Cuinet, a French geographer, reported in 1891 that with its 135 total localities,  Bulanik was second only to the kaza of Moush, which, in his estimation, had 194 localities. Bensé reported in the late-1890s that the county’s population comprised of Armenians and Kurds, and a few Circassians, all of whom lived in 52 villages. Ottoman salnamé from 1898 listed 53 total villages. Mayewski identified 52 total localities. Hakobyan et al. counted 63 villages in the early-1900s, of which 29 (a figure they apparently borrowed from A-Do) were Armenian-inhabited. Martirosian tabulated 28 Armenian villages, wrongly adding Malakhdran, a locality in the kaza of Moush, to the list, which brings the number down to 27. The Patriarchate listed 30 Armenian villages prior to World War I. Atrpet reported 40 Armenian villages in Bulanik prior to the genocide in 1915, wrongly including twelve localities of adjacent counties in the list, which brings the number down to 28. Of all the figures, Philippov clearly underreported the number of villages containing Armenians, while Cuinet over-reported the total number of villages. 1. Nazaret Martirosian, “Hamayevropakan Paterazmi entatskoum amayatsats Arevelyan Hayastani gavarneri vichakagrutioune [Statistics of Eastern Armenian Prefectures Desolated during the First World War]”, in Van-Tosp, no. 14 (1916). 2. Philippov, Vladimir N., Voennoe obozrenie Aziatskoi Turcii (A Military Review of Asiatic Turkey). (Saint Petersburg: A.E. Landau Publishing House, 1881). Between 1880 and 1881, Ottoman authorities included the territory of Bulanik in the vilayet of Bitlis, also known as Baghesh. The kaza of Bulanik comprised of two sub-districts (nahiyes): Upper Bulanik and Lower Bulanik, with administrative centers in Kop and Liz, respectively. This administrative change and the subsequent influx of Kurdish tribes distorted the county’s demographic composition. Armenians were required to offer so-called hospitality to Muslims, lodge them in their houses, where these guests and their horses were to be fed. In the winter months, Armenians were required to abide by an Ottoman requirement called kshlak (kışlak), that is, to provide pastures to Muslim nomads, which, apart from the financial burden, oftentimes led to pillaging and violence. Consequently, by the mid-nineteenth century, a number of Armenian villages were abandoned. Seizing this opportunity, Kurds settled in these villages, especially those in Lower Bulanik. Ottoman authorities heightened tensions when, after the 1877 – 1878 Russo-Turkish and the 1912 – 1913 First Balkan Wars, they encouraged the resettlement of Muslim refugees from the Caucasus, muhajirs, thus boosting the number of Muslims in the Bulanik villages and increasing the threat to Armenians, as these Muslims shifted their hatred of Russian and southeastern European Christians onto Armenians. Ottoman rule and the Kurdish influx notwithstanding, Bulanik remained an area especially densely populated by Armenians. British consul-general John George Taylor reported there were 10,000 Armenians and 7,000 Kurds in Bulanik in 1869. According to a Moush Prelacy count, in the 1870s in 2,049 households 5,476 men lived in Bulanik, of whom 4,035 were Christians and 1,441 Muslims. Based on this figure, a rough estimate would put the number of Armenians at more than 8,000. As reported by the Russian vice-consul in Van, Alexis Kolyubakin, in the mid-1880s, Armenians amounted to 67 percent of the total population, or more than 20,000 inhabitants. A-Do suggested that there were 2,025 Armenian households or 14,175 inhabitants in Bulanik circa 1890. In Cuinet’s estimation, of 23,361 inhabitants, 10,361 were Armenians and 13,000 Kurds. However, if the total number of Armenians in Bulanik is divided by 135 (what Cuinet suggests for the number of Bulanik villages), the number of Armenians per village is estimated to be unbelievably low, at 77 people or ten households per village. 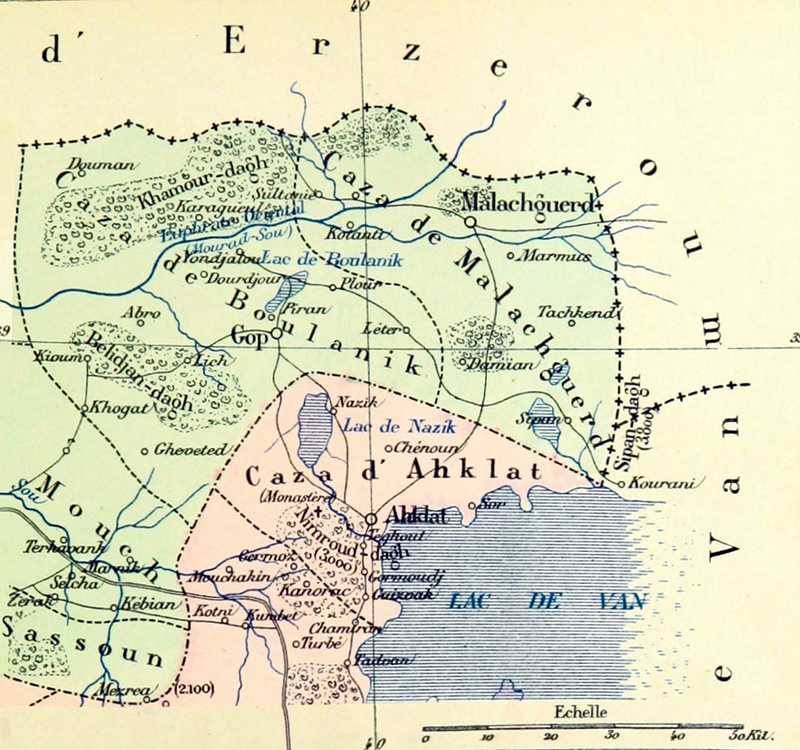 The 1893 Ottoman census put the Armenian population in Bulanik, Manazkert, Vardo and Sassoun at 25,873. If this figure is divided by four, the number of Armenians in Bulanik would be improbably low, at 6,500. 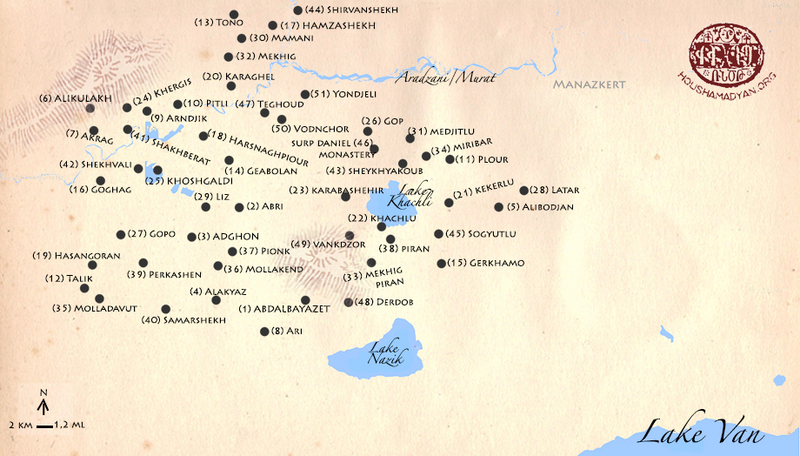 Below is the list of the Armenian-inhabited villages of Bulanik and their population, as recorded in various sources and as they are drawn by V. Mirzoyants on the map “Bulanik or Hark” in Bensé’s treatise “Bulanik or Hark County.” The list includes locations and both pre-1915 and present-day Turkified names of the villages. The latter are placed in brackets. Unless otherwise mentioned, the data submitted below are drawn from sources covering a period of about 25 years or from the 1890s to 1915. Because these various sources contain discordant and oftentimes conflicted demographic data, no attempt is made in this study (nor does it seem feasible to make such an attempt) to compare and contrast the data. -The village was situated in the mountainous terrain eighteen kilometers (eleven miles) southeast of Kop and east of Lake Khachli. A-Do stated that there were three Armenian and twenty Kurdish households in this village. This would place the number of Armenian inhabitants at 24. In Martirosian’s updated statistical table, this village was not reported. According to the Patriarchate census figures, prior to World War I, the village had four Armenian households or 37 inhabitants and 26 Kurdish households or an unspecified number of inhabitants. Teodik reported four Armenian households prior to the genocide. An estimate supplied by a group of genocide survivors put the number of Armenian households at five and the number of Armenian inhabitants at 51. -The village was situated on a lowland eleven kilometers (seven miles) east of Kop, northeast of Lake Khachli on the left bank of Mrbar, a tributary of Kor-djour itself a tributary of the Aratsani (Murat) River. A-Do stated that there were 60 Armenian and fifteen Kurdish households in this village, placing the number of Armenian inhabitants at 480. Mirakhorian identified twenty Armenian households. Mayewski lists 65 Armenian and fifteen Kurdish households. In Martirosian’s updated statistical table, the village had 27 Armenian households or 175 inhabitants, and twenty Kurdish households or 107 inhabitants. According to Hakobyan et al., in the early-1900s, the village had 45 Armenian and fifteen Kurdish households. 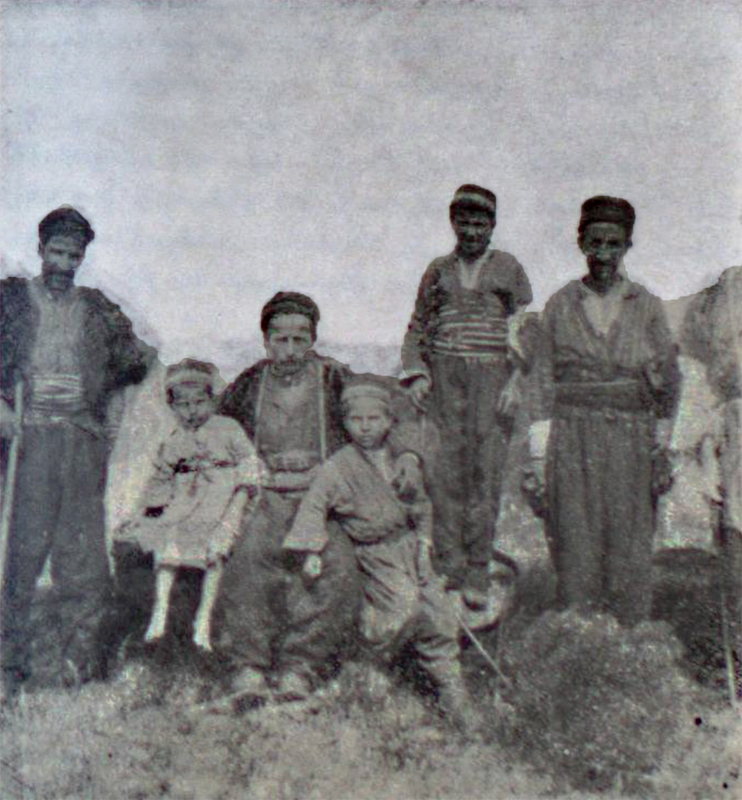 According to the Patriarchate census figures, prior to World War I, the village had 26 Armenian households or 182 inhabitants and unspecified number of Kurdish households or 462 inhabitants. Atrpet reported 38 Armenian households prior to the genocide. Teodik reported 40 Armenian households prior to the genocide. -The exact location of Dono is unknown. Most likely it was a hamlet situated about five kilometers (three miles) west of Hamzashekh on a slope of the Zernak Mountains. This village may no longer exist. Because Dono is purportedly identified with the Donevank or Drnevank village that figured in a late medieval Armenian chronicle as a locality of the Hark county , it is fair to assume that the village was formerly populated by Armenians. No other source used for this study made mention of a village under such name or a variation of it. -The village was situated eighteen kilometers (eleven miles) southeast of Kop, southeast of Lake Khachli. Mayewski identified twenty Kurdish households in the village, which is marked on the map in Bensé’s “Bulanik or Hark” as a locality in Upper Bulanik. Index Anatolicus identified the village as a locality in Bulanik. The other sources used for this study made no mention of a village under such name or a variation of it. -The village was situated fifteen kilometers (ten miles) northwest of Kop on a slope of the Zernak Mountains at the point of confluence of the Aratsani (Murat) River and its right-bank tributary, Khnous. According to “Msho ashkhar,” in the late-1870s, Hamzashekh was one of the largest villages in Bulanik; Philippov shared this view in the early-1880s. A-Do states that there were 150 Armenian and no Kurdish households in the village. This would place the number of Armenian inhabitants at 1,200. Mirakhorian identified 150 Armenian households. Mayewski stated that there were 110 Armenian households. In Martirosian’s updated statistical table, the village had 179 Armenian households or 1,264 inhabitants and fifteen Kurdish households or 93 inhabitants. According to the Patriarchate census figures, prior to World War I, the village had 80 Armenian households or 1,299 inhabitants and an unspecified number of Kurdish households or 80 inhabitants, as well as 25 Circassians. Atrpet reported 111 Armenian households prior to the genocide. Teodik reported 80 Armenian households prior to the genocide. An estimate supplied by genocide survivor, Mourad Mkhitarian, put the number of Armenian households at 270 and the number of Armenian inhabitants at 3,000. Hamzasheykh is not to be confused with the homonymous village in Bulanik, which had eight households entirely inhabited by Kurds. -The village was situated sixteen kilometers (ten miles) northwest of Kop on the right bank of the Aratsani (Murat) River. Lynch described Karaghel, to which he refers as Karaogli, as an Armenian village. A-Do stated that there were 85 Armenian and 25 Kurdish households in the village. This would place the number of Armenian inhabitants at 680. Mirakhorian identified 90 mixed households, most of which were Kurdish. Mayewski listed 105 Armenian and ten Kurdish households. In Martirosian’s updated statistical table, the village had 186 Armenian households or 1,372 inhabitants and fourteen Kurdish households or 80 inhabitants. According to Hakobyan et al., in the early-1900s, the village had 95 ethnically unspecified households. According to the Patriarchate census figures, prior to World War I, the village had 165 Armenian households or 1,312 inhabitants, as well as 60 Turks. Atrpet reported 191 Armenian households prior to the genocide. Teodik reported 160 Armenian households prior to the genocide. An estimate supplied by genocide survivor Father Harutioun Poyadjian put the number of Armenian households at 211 and the number of Armenian inhabitants at 1,838. Estimates supplied by two genocide survivors, Gevorg Ghazarian and Sayad Astvatsatrian, put the number of Armenian households at 200 and 250, respectively. -The village was situated twelve kilometers (eight miles) southeast of Kop on a high plateau near the eastern shore of Lake Khachli. According to “Msho ashkhar,” Kekerlu was one of the largest villages in Bulanik in the late-1870s. Lynch described the village, to which he refers as Kekeli, as a large Armenian settlement. A-Do stated that there were 100 Armenian and 35 Kurdish households in the village, placing the number of Armenian inhabitants at 800. Mirakhorian identified 80 to 90 Armenian households. Mayewski stated that there were 80 Armenian households. In Martirosian’s updated statistical table, the village had 215 Armenian households or 1,506 inhabitants and eleven Kurdish households, or 52 inhabitants. According to the Patriarchate census figures, prior to World War I, the village had 189 Armenian households or 1,306 inhabitants and an unspecified number of Kurdish households or 38 inhabitants, as well as four Circassian households. Atrpet reported 207 Armenian households prior to the genocide. Teodik reported 190 Armenian households prior to the genocide. -The village was situated eleven kilometers (seven miles) south of Kop on the southern shore of Lake Khachli. -One monastery (one church, according to the 1913 Patriarchate census). A-Do stated that there were ten Armenian and 40 Kurdish households in the village. This would place the number of Armenian inhabitants at 80. Mirakhorian asserted that until 1865, the village was populated entirely by Armenians, who lived in 50 households, of which, by 1885 only seven to eight remained, while the rest, about 35 households, were populated by newly-settled Kurds. Mayewski lists two Armenian and 48 Kurdish households. In Martirosian’s updated statistical table, this village was not reported. 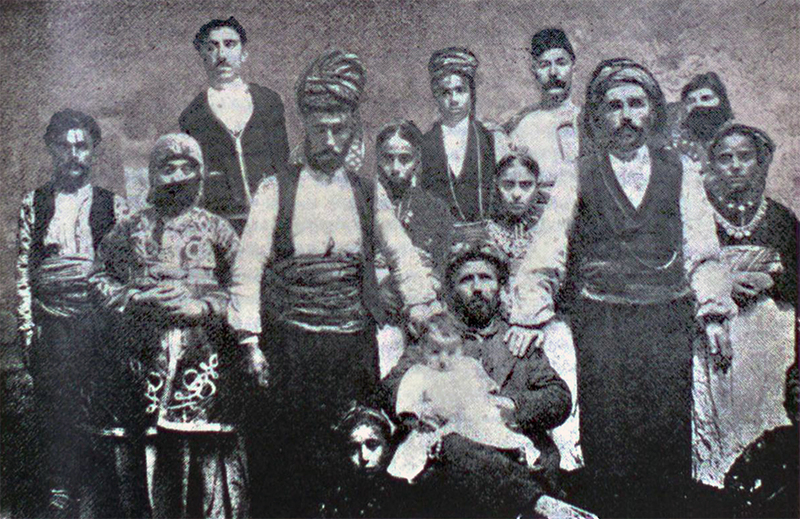 Bensé suggested that at the end of the nineteenth century there were 25 to 30 households in the village, of which only one was Armenian and the rest Kurdish. According to the Patriarchate census figures, prior to World War I, the village had two Armenian households or 39 inhabitants and an unspecified number of Kurdish households or 283 inhabitants. Atrpet reported twelve Armenian households prior to the genocide. Teodik reported two Armenian households prior to the genocide. -The village was situated nine kilometers (six miles) southwest of Kop near the western shore of Lake Khachli at the northeastern root of Bilejan mountain. Hakobyan et al. suggested that in the 1850s the village had seventeen ethnically unspecified households or 137 inhabitants. According to “Msho ashkhar,” Kharabashehir was one of the largest villages in Bulanik in the late-1870s. A-Do stated that there were 30 Armenian and 50 Kurdish households in the village. This would place the number of Armenian inhabitants at 240. Mirakhorian identified twenty Armenian households. Mayewski listed 30 Armenian and ten Kurdish households. In Martirosian’s updated statistical table, the village had 77 Armenian households or 606 inhabitants and twelve Kurdish households, or 91 inhabitants. According to the Patriarchate census figures prior to World War I, the village had 67 Armenian households, or 572 inhabitants and an unspecified number of Kurdish households, or 99 inhabitants. Teodik reported 80 Armenian households prior to the genocide. An estimate supplied by genocide survivor, Ghazar Parveyan, put the number of Armenian households at 70. Another survivor, Gevorg Manoukian, put the number of Armenian households at 90 and the number of Armenian inhabitants at 1,400. -The town was situated 78 kilometers (49 miles) northeast of Moush and 24 kilometers (fifteen miles) west of Manazkert on the road from Manazkert to Moush, northeast of Bilejan mountain and north of Lake Khachli, on the bank left of the Kor-djour River. By the end of the Ottoman era, Kop became the principal town of the kaza of Bulanik, as well as the administrative center of the Upper Bulanik nahiye. A-Do stated that there were 450 Armenian and 130 Kurdish households, placing the number of Armenian inhabitants at 3,600. Mirakhorian identified 300 Armenian and five Kurdish households. Mayewski listed 350 Armenian and 70 Kurdish households. The periodical Mshak reported that in 1890, Kop had 500 households and was a populous Armenian town. Cuinet suggested that in 1891, there were 200 mixed households in Kop. Lynch indicated that there were 400 households — all but 50 inhabited by Armenians. Bensé suggested that in the late-1890s, the town had 450 purportedly mixed households and 1,409 male inhabitants. Given Bensé’s figure, a rough estimate would suggest that around 3,000 men and women inhabited Kop at the time. In Martirosian’s updated statistical table, the town had 543 Armenian households or 4,513 inhabitants and 156 Kurdish households or 757 inhabitants. According to the Patriarchate census figures, prior to World War I, the town had 500 Armenian households or 5,000 Armenian inhabitants and 40 Kurdish households or an unspecified number of inhabitants, as well as 60 Turkish households. Atrpet reported 600 Armenian and 150 Kurdish and Turkish households prior to the genocide. Teodik reported 5,000 Armenian inhabitants prior to the genocide. An estimate supplied by one group of genocide survivors put the number of Armenian households at 600 and the number of Armenian inhabitants at 6,000. Another group of survivors put the number of Armenian households at 380. Survivor Nikoghos Mkhitarian estimated the number of Armenian households at 217. To the south of Kop stood a monastic complex, which contained the relics of the choir bishop Daniel the Assyrian. -The monastery stood not far from the southern quarter of Kop, one kilometer (.62 miles) southward from the Kop town center in the direction of Lake Khachli. The monastery’s close proximity to Kop earned it the name “Kopavank” (the monastery at Kop). In Martirosian’s updated statistical table, the monastery had one household, which almost certainly should be understood as the residence of the vice-prelate of Moush, as well as a different structure that contained several rooms for the monks. The thirteen inhabitants mentioned on Martirosian’s list obviously comprised two to three members of monastic clergy and several monastery laborers. -The village was situated at the southeastern edge of Upper Bulanik nineteen kilometers (twelve miles) southeast of Kop east of Lake Khachli. Lynch described this village as large, partly Kurdish and partly Armenian. A-Do indicated that, circa the 1870s, the village was entirely populated by Armenians and had 300 households; in the early twentieth century there were 80 Armenian and 240 Kurdish households. This would place the number of Armenian inhabitants at 640. Mirakhorian identified about 50 Armenian and twenty Kurdish households. Mayewski listed 76 Armenian and 90 Kurdish households. Bensé suggested that in the late-1890s the village had twenty to 30 Armenian households and several households of notable Kurdish sheikhs. This would place the number of Armenian inhabitants at 640. In Martirosian’s updated statistical table, the village had 100 Armenian households or 675 inhabitants and 227 Kurdish households or 1,104 inhabitants. According to the Patriarchate census figures, prior to World War I, the village had 90 Armenian households or 700 inhabitants and 130 Kurdish households or an unspecified number of inhabitants. Atrpet reported 36 Armenian households prior to the genocide. Teodik reported 90 Armenian households prior to the genocide noting that by the mid-nineteenth century their number amounted to 300, which dwindled as Kurdish sheikhs laid hands on most pastures that belonged to the Armenians. An estimate supplied by genocide survivor Father Khachatour Melkonian put the number of Armenian households at 70 and the number of Armenian inhabitants at 700. -The village was situated eighteen kilometers (eleven miles) northwest of Kop and south of the Zernak Mountains, on the bank of Belbelik, a tributary of Khnous itself a right-bank tributary of the Aratsani (Murat) River. Mayewski identified 35 Kurdish households in the village. According to Hakobyan et al., in the early-1900s the village had fifteen ethnically unspecified households. The village is marked on the map in Bensé’s “Bulanik or Hark” as a locality in Upper Bulanik. Index Anatolicus identified the village as a locality in Upper Bulanik. The other sources used for this study made no mention of a village under such name or a variation of it. -The village was situated five kilometers (three miles) east of Kop on the road from Manazkert to Kop, on the left bank of Mrbar, a tributary of the Kor-djour River. A-Do stated that there were 125 Armenian and no Kurdish households in the village. This would place the number of Armenian inhabitants at 1,000. Mirakhorian identifies 80 Armenian and five Kurdish households. Mayewski lists 55 Armenian and five Kurdish households. In Martirosian’s updated statistical table, the village had 135 Armenian households or 950 inhabitants and no Kurds. According to the Patriarchate census figures, prior to World War I, the village had 120 Armenian households or 850 inhabitants. Atrpet reported 95 Armenian households prior to the genocide. Teodik reported 130 Armenian households prior to the genocide. An estimate supplied by a group of genocide survivors put the number of Armenian households at 110. Kévorkian mentioned no village by the name of Medjitlu or Mashtlu, but referred to certain Maltlu village, which, he suggested, prior to the genocide had 195 Armenian households. However, the other sources used for this study make no mention of a village under the name “Maltlu” or a variation of it. On the map in Bensé’s “Bulanik or Hark,” we see a certain Mashltu village situated northwest of the Blour village. However, its location on the map suggests that the artist, V. Mirzoyants, might have mistakenly assigned a wrong name to the Miribar village. -The village was situated eighteen kilometers (eleven miles) northwest of Kop on the left bank of the Khnous River. Mayewski identified 25 Kurdish households in the village. Hakobyan et al. suggested that in the early-1900s the village had eight ethnically unspecified households and unspecified other sources indicated that previously the village was populated entirely by Armenians. Index Anatolicus identified the village as a locality in Upper Bulanik. -The village was situated sixteen kilometers (ten miles) south of Kop at the eastern root of Bilejan mountain. Index Anatolicus identified the village by its Kurdified name Piran Méxiği as a locality in Upper Bulanik. Because the village was situated in close proximity to Armenian localities of Piran and Khachlu, it is fare to assume that the village was formerly populated by Armenians. The other sources used for this study made no mention of a village under such name or a variation of it. -The village was situated eight kilometers (five miles) southeast of Kop near the northeastern shore of Lake Khachli, on the left bank of Mrbar, a tributary of the Kor-djour River. A-Do stated that there were 30 Armenian and sixteen Kurdish households in the village. This would place the number of Armenian inhabitants at 240. Mirakhorian identifies 25 mixed Armenian and Kurdish households. Mayewski stated that there were 60 Armenian households. Bensé suggested that in the late-1890s, the village had at most twenty Armenian households. In Martirosian’s updated statistical table, the village had 50 Armenian households or 472 inhabitants and no Kurdish households. According to the Patriarchate census figures, prior to World War I, the village had 50 Armenian households or 472 inhabitants. Teodik reported 80 Armenian households prior to the genocide. -The village was situated thirteen kilometers (eight miles) south of Kop near the southern shore of Lake Khachli on the bank of a stream that flowed southward from the lake. A-Do stated that there were twenty Armenian and 60 Kurdish households in the village. This would place the number of Armenian inhabitants at 160. Referring to the village as Biran, Mirakhorian identified 50 Armenian households. Mayewski listed 45 Armenian and fifteen Kurdish households. In Martirosian’s updated statistical table, the village had 45 Armenian households or 341 inhabitants and 28 Kurdish households or 149 inhabitants. According to the Patriarchate census figures, prior to World War I, the village had 64 Armenian households or 446 inhabitants and an unspecified number of Kurdish households or 143 inhabitants. Atrpet reported 35 Armenian households prior to the genocide. Teodik reported 64 Armenian households prior to the genocide. -The village was situated seven kilometers (four miles) southeast of Kop near the northeastern shore of Lake Khachli at the foot of lesser heights connected with Bilejan mountain, on the right bank of the Kor-djour River. Hakobyan et al. suggested that in the 1850s, this village had about 600 ethnically unspecified households; in the early-1900s, this number had dropped to something between 114 and 200. According to “Msho ashkhar,” Sheykhyakoub was one of the largest villages in Bulanik in the late 1870s. A-Do stated that there were 120 Armenian and twenty Kurdish households in the village. This would place the number of Armenian inhabitants at 960. Mirakhorian identified 150 Armenian households. Mayewski stated that there were 114 Armenian households. Lynch concurred that Sheykhyakoub was a very large Armenian village. Bensé suggested that in the late-1890s the village had about 200 households and was entirely populated by Armenians. In Martirosian’s updated statistical table, the village had 185 Armenian households or 1200 inhabitants and six Kurdish households or 33 inhabitants. According to the Patriarchate census figures, prior to World War I, the village had 200 Armenian households or 1,200 inhabitants. Atrpet reported 200 Armenian households prior to the genocide. Teodik similarly reported 200 Armenian households prior to the genocide. An estimate supplied by genocide survivor, Harutioun Frangoulian, puts the number of Armenian households at 250 and the number of Armenian inhabitants at 1,800. Estimates supplied by two other genocide survivors, Peto Simonian and Abraham Harutiounian, put the number of Armenian households at 200. -The village was situated fifteen kilometers (nine miles) northwest of Kop on the right bank of the Khnous River. A-Do stated that there were 150 Armenian and no Kurdish households in the village. This would place the number of Armenian inhabitants at 1,200. Philippov described Shirvanshekh as one of the largest villages on the Plain of Bulanik in the early-1880s. Mirakhorian identified 100 Armenian households. Mayewski stated that there were 130 Armenian households. In Martirosian’s updated statistical table, the village had 168 Armenian households or 1141 inhabitants and two Kurdish households or nine inhabitants. According to the Patriarchate census figures, prior to World War I, the village had 150 Armenian households or 1,300 inhabitants. Atrpet reported 200 Armenian households prior to the genocide. Teodik reported 150 Armenian households prior to the genocide. An estimate supplied by genocide survivor Father Mikayel Ter-Samuelian, put the number of Armenian households at 180 and the number of Armenian inhabitants at 2,000. -The village was situated fourteen kilometers (nine miles) southeast of Kop near the southeastern shore of Lake Khachli. Mayewski identified 48 Kurdish households in the village. According to Hakobyan et al., in the early-1900s, the village had 44 ethnically unspecified households. The village is marked on the map in Bensé’s “Bulanik or Hark” as a locality in Upper Bulanik. The other sources used for this study made no mention of a village under such name or a variation of it. -The village was situated on the road from Kop to Khnous twelve kilometers (eight miles) west of Kop near the point of confluence of the Aratsani (Murat) River and its left-bank tributary Kor-djour. According to “Msho ashkhar,” Teghout was one of the largest villages in Bulanik in the late-1870s. This view was shared by Philippov in the early-1880s. According to Hakobyan et al., in the 1880s the village had 70 ethnically unspecified households. A-Do stated that there were 70 Armenian and 35 Kurdish households in the village. This would place the number of Armenian inhabitants at 560. Mirakhorian identified 80 to 90 Armenian households. Mayewski stated that there were 130 Armenian households. In Martirosian’s updated statistical table, the village had 180 Armenian households or 1186 inhabitants and 33 Kurdish households or 197 inhabitants. According to the Patriarchate census figures, prior to World War I, the village had 221 Armenian households or 1,168 inhabitants and an unspecified number of Kurdish households or 35 inhabitants, as well as 287 Turks. Atrpet reported 194 Armenian households prior to the genocide. Teodik reported 160 Armenian households prior to the genocide. -The village was situated thirteen kilometers (eight miles) south of Kop at the northeastern root of Bilejan mountain. The village figures in an 1878 Armenian census of the Moush sandjak. It is fair to assume, therefore, that it was populated by Armenians. Mayewski listed fifteen Kurdish households. -The village was situated nine kilometers (six miles) southwest of Kop west of Bilejan mountain. -Two churches (one church, according to the 1913 Patriarchate census). According to “Msho ashkhar,” Votnchor was one of the largest villages in Bulanik in the late-1870s. This view was shared by Philippov in the early 1880s. A-Do stated that there were 90 Armenian and twenty Kurdish households in the village. This would place the number of Armenian inhabitants at 720. Mirakhorian identified 105 Armenian households. Mayewski listed 107 Armenian and three Kurdish households. In Martirosian’s updated statistical table, the village had 170 Armenian households or 1,044 inhabitants and twelve Kurdish households or 57 inhabitants. According to Hakobyan et al., in the early-1900s, the village had 120 to 200 households, most of which were Armenian. According to the Patriarchate census figures, prior to World War I, the village had 191 Armenian households or 1,295 inhabitants and an unspecified number of Kurdish households or 51 inhabitants. Atrpet reported 151 Armenian households prior to the genocide. Teodik reported 190 Armenian households prior to the genocide. -The village was situated nine kilometers (six miles) northwest of Kop on the right bank of the Kor-djour River. According to “Msho ashkhar,” Yondjeli was one of the largest villages in Bulanik in the late-1870s. This view was shared by Philippov in the early 1880s. A-Do stated that Yondjeli was an entirely Armenian-populated locality and that there were 250 Armenian and no Kurdish households in the village. This would place the number of Armenian inhabitants at 2,000. Mirakhorian identified 150 Armenian households. Mayewski stated that there were 180 Armenian households. Lynch described Yondjeli as a large Armenian village. In Martirosian’s updated statistical table, the village had 225 Armenian households or 1,650 inhabitants and twelve Kurdish households or 100 inhabitants. According to the Patriarchate census figures, prior to World War I, the village had 263 Armenian households or 1,560 inhabitants, as well as 100 Turks. Atrpet reported 192 Armenian households prior to the genocide. Teodik reported 260 Armenian households prior to the genocide. An estimate supplied by genocide survivor, Garegin Khachatourian, put the number of Armenian households at 260 and the number of Armenian inhabitants at 2,500. -The village was situated fifteen kilometers (ten miles) southeast of Liz on the southwestern root of the Bilejan mountain. Mayewski stated that there were 35 Kurdish households in the village. Index Anatolicus identified the village as a locality in Lower Bulanik. The other sources used for this study made no mention of a village under such name or a variation of it. -The village was situated seven kilometers (four miles) east of Liz on the northwestern root of the Bilejan mountain. A-Do stated that there were 30 Armenian and 80 Kurdish households in the village. This would place the number of Armenian inhabitants at 240. Mirakhorian identified 75 to 80 households evenly split between Armenian and Kurdish households. Mayewski stated that there were 80 Kurdish households. Bensé reported that in the late-1890s, Armenians and the families of notable Kurdish sheikhs inhabited the village. In Martirosian’s updated statistical table, the village had 45 Armenian households or 278 inhabitants and 140 Kurdish households or 1,056 inhabitants. According to the Patriarchate census figures, prior to World War I, the village had 31 Armenian households or 203 inhabitants and an unspecified number of Kurdish households or 780 inhabitants. Atrpet reported 30 Armenian households prior to the genocide. Teodik reported 50 Armenian households prior to the genocide. An estimate supplied by a group of genocide survivors put the number of Armenian households at 40. -The village was situated four kilometers (two miles) southwest of Liz west of the Bilejan mountain. According to “Msho ashkhar,” Adghon was one of the largest villages in Bulanik in the late-1870s. A-Do stated that there were 38 Armenian and five Kurdish households in the village. This would place the number of Armenian inhabitants at 304. Mirakhorian identifies 90 Armenian and three Kurdish households. Mayewski lists 55 Armenian and fifteen Kurdish households. In Martirosian’s updated statistical table, the village had 109 Armenian households or 835 inhabitants and 24 Kurdish households or 113 inhabitants. According to Hakobyan et al., in the early-1900s the village had 100 Armenian and 30 Kurdish households, and prior to World War I, 30 Armenian and five Kurdish households. According to the Patriarchate census figures, prior to World War I, the village had 95 Armenian households or 754 inhabitants and an unspecified number of Kurdish households or 85 inhabitants, as well as 89 Turks. Atrpet reported 45 Armenian households prior to the genocide. Teodik reported 120 Armenian households prior to the genocide. An estimate supplied by one genocide survivor, Harutioun Ter-Movsissian, put the number of Armenian households at 150. Another survivor, Avetis Baghdassarian, estimated the number of Armenian inhabitants at 1,500. - The village was situated sixteen kilometers (ten miles) northwest of Liz on the right bank of the Aratsani (Murat) River on a higher level of the basin-like area. A-Do stated that there were 45 Armenian and 30 Kurdish households in the village. This would place the number of Armenian inhabitants at 360. Mirakhorian identified 50 to 55 mixed Armenian and Kurdish households. Mayewski listed 25 Armenian and fifteen Kurdish households. Lynch described Akrag as an Armenian village. In Martirosian’s updated statistical table, the village had 40 Armenian households or 283 inhabitants and 22 Kurdish households or 140 inhabitants. According to the Patriarchate census figures, prior to World War I, the village had 30 Armenian households or 267 inhabitants. Atrpet reported 35 Armenian households prior to the genocide. Teodik reported 50 Armenian households prior to the genocide. -The village was situated eleven kilometers (seven miles) south of Liz near the western shore of Lake Nazik. Mayewski stated that there were 25 Kurdish households. Atrpet reported six Armenian households prior to the genocide. Index Anatolicus placed the village two kilometers (one mile) southwest of the Neynik (present-day Uzgörür) village. The Center for the Study of Western Armenia and Western Armenians listed the village in the localities of the Moush sandjak. The other sources used for this study made no mention of a village under such name or a variation of it. -The village was situated eighteen kilometers (eleven miles) northwest of Liz near the right bank of the Aratsani (Murat) River. Mayewski stated that there were ten Kurdish households in the village. According to Hakobyan et al., in the early-1900s, the village had five ethnically unspecified households. The Center for the Study of Western Armenia and Western Armenians listed the village in the localities of the Moush sandjak. The other sources used for this study made no mention of a village under such name or a variation of it. -The village was situated eighteen kilometers (eleven miles) southeast of Liz near the western shore of Lake Nazik. Mayewski stated that there were nine Kurdish households in the village. Hakobyan et al. placed the village at the southernmost edge of Bulanik, which suggests it could be part of Lower Bulanik. Index Anatolicus placed the village eight kilometers (five miles) southeast of the Neynik (present-day Uzgörür) village. The other sources used for this study made no mention of a village under such name or a variation of it. -The village was situated thirteen kilometers (eight miles) northwest of Liz at the easternmost edge of the Plain of Moush on the right bank of the Aratsani (Murat) River. Lynch described Arndjik as a little Kurdish village. Mayewski listed two Armenian and 40 Kurdish households. Teodik reported two Armenian households prior to the genocide. Arndjik is not to be confused with the homonymous Armenian-inhabited village of Arindjik (Arindj) in the Moush county. -The village was situated thirteen kilometers (eight miles) north of Liz on the right bank of the Aratsani (Murat) River. Mayewski identified ten Kurdish households in the village. The village is marked on the map in Bensé’s “Bulanik or Hark” as a locality in Lower Bulanik. Index Anatolicus identified the village as a locality in Lower Bulanik. The Center for the Study of Western Armenia and Western Armenians lists this village among the localities in the Moush sandjak. The other sources used for this study made no mention of a village under such name or a variation of it. -The village was situated eighteen kilometers (eleven miles) southwest of Liz. Mayewski stated that there were twenty Kurdish households in the village. The village is marked on the map in Bensé’s “Bulanik or Hark” as a locality in Lower Bulanik. Index Anatolicus identified the village as a locality in Lower Bulanik. The other sources used for this study made no mention of a village under such name or a variation of it. -The village was situated six kilometers (four miles) northeast of Liz west of the Bilejan mountain. A-Do stated that there were 30 Armenian and 40 Kurdish households in the village. This would place the number of Armenian inhabitants at 240. Mayewski listed twenty Armenian and ten Kurdish households. In Martirosian’s updated statistical table, the village had 35 Armenian households or 265 inhabitants and 75 Kurdish households or 416 inhabitants. According to the Patriarchate census figures, prior to World War I, the village had 29 Armenian households or 251 inhabitants and an unspecified number of Kurdish households or 294 inhabitants. Atrpet reported eighteen Armenian households prior to the genocide. Teodik reported 60 Armenian households prior to the genocide. An estimate supplied by genocide survivor, Nazar Mkhitarian, put the number of Armenian households at twenty. -The village was situated thirteen kilometers (eight miles) west of Liz on the left bank of Lza-get (Vard), a tributary of the Aratsani (Murat) River. According to “Msho ashkhar,” Goghag was one of the largest villages in Bulanik in the late-1870s. A-Do stated that there were 45 Armenian and 180 Kurdish households in the village. This would place the number of Armenian inhabitants at 360. Mirakhorian identified 40 Armenian and 50 Kurdish households. Mayewski stated that the village was evenly split with 40 Armenian and 40 Kurdish households. In Martirosian’s updated statistical table, the village had 48 Armenian households or 471 inhabitants and 180 Kurdish households or 1,430 inhabitants. According to the Patriarchate census figures, prior to World War I, the village had 69 Armenian households or 472 inhabitants and an unspecified number of Kurdish households or 784 inhabitants. Atrpet reported 91 Armenian households prior to the genocide. Teodik reported 120 Armenian households prior to the genocide. An estimate supplied by genocide survivor, Noyem Noreyan, put the number of Armenian households at 100. -The village was situated nine kilometers (five miles) north of Liz near the left bank of the Aratsani (Murat) River. Index Anatolicus identified the village by its Kurdified name Kanî sipî (“white spring-well”) as a locality in Lower Bulanik. It is fair to assume that the village was formerly populated by Armenians. The other sources used for this study made no mention of a village under such name or a variation of it. -The village was situated fifteen kilometers (nine miles) southwest of Liz. Mirakhorian identified fifteen to twenty Kurdish households in the village. Mayewski stated that there were 50 Kurdish households. The village is marked on the map in Bensé’s “Bulanik or Hark” as a locality in Lower Bulanik. Hakobyan et al. place the village at the westernmost edge of Bulanik, which suggests that it was a locality in Lower Bulanik. Index Anatolicus identified the village as a locality in Lower Bulanik. The other sources used for this study made no mention of a village under such name or a variation of it. -The location of this village cannot be determined. According to Kévorkian, prior to the genocide, the village had 60 Armenian households. This would place the number of Armenian inhabitants at 480. A certain village by the name of Girolan, nearly identical in pronunciation with Kerolan, figures on Bensé’s list of Armenian villages of the Plain of Moush and Bulanik in “Hark: Bulanik county of Moush.” The other sources used for this study made no mention of a village under such name or a variation of it. -The village was situated fourteen kilometers (nine miles) northwest of Liz near the right bank of the Aratsani (Murat) River. Index Anatolicus identified the village as a locality in Lower Bulanik. A certain village by the name of Kharghos, nearly identical in pronunciation with Khergis, figures on Bensé’s list of Armenian villages of the Plain of Moush and Bulanik in “Hark: Bulanik county of Moush.” It could be, however, that Bensé misspelled the name of Khartos, a village in the kaza of Moush. It is fair to assume that the village was formerly populated by Armenians. The other sources used for this study made no mention of a village under such name or a variation of it. -The village was situated seven kilometers (five miles) northwest of Liz on the left bank of the Lza-get (Vard) River. According to “Msho ashkhar,” Khoshgaldi was one of the largest villages in Bulanik in the late-1870s. A-Do stated that there were 120 Armenian and fifteen Kurdish households in the village. This would place the number of Armenian inhabitants at 960. Mirakhorian identified 94 Armenian and several Kurdish households. Mayewski lists 80 Armenian and ten Kurdish households. In Martirosian’s updated statistical table, the village had 170 Armenian households or 1,428 inhabitants and 40 Kurdish households or 280 inhabitants. According to the Patriarchate census figures, prior to World War I, the village had 140 Armenian households or 1,018 inhabitants and an unspecified number of Kurdish households or 115 inhabitants, as well as 87 Turks. Atrpet reported 120 Armenian households prior to the genocide. Teodik reported 180 Armenian households prior to the genocide. An estimate supplied by genocide survivor, Nahapet Melikian, put the number of Armenian households at 150 and the number of Armenian inhabitants at 2,000. -The village was situated eleven kilometers (seven miles) west of Liz. Until the 1870s, this village was entirely inhabited by Armenians. Afterward, Ottoman authorities encouraged the resettlement of Circassians from the Caucasus who laid hands on pastures that belonged to the Armenian villagers, forcing many families to abandon properties and flee. A-Do stated that there were 60 Armenian and 80 Kurdish households in the village. This would place the number of Armenian inhabitants at 480. Mayewski stated that there were 50 Kurdish households. In Martirosian’s updated statistical table, the village was not reported. According to the Patriarchate census figures, prior to World War I, the village had 60 Armenian households or 489 Armenian inhabitants. Atrpet reported 70 Armenian households prior to the genocide. -The town was situated on a hill at the western root of the Bilejan mountain on the left bank of the Lza-get (Vard) River northwest of Lake Nazik, 58 kilometers (36 miles) northeast of Moush and twenty kilometers (thirteen miles) southwest of Kop. Liz was the administrative center of the Lower Bulanik nahiye. A-Do stated that Liz was an entirely Armenian-populated locality and that there were 200 Armenian and no Kurdish households. This would place the number of Armenian inhabitants at 1,600. Mirakhorian identified 180 to 200 Armenian households. Mayewski listed 180 Armenian and ten Kurdish households. Lynch described the locality as a principal town in Bulanik. Bensé suggested that in the late-1890s Liz had 250 households entirely populated by Armenians. In Martirosian’s updated statistical table, the village had 275 Armenian households or 1,768 inhabitants and 35 Kurdish households or 205 inhabitants. According to Hakobyan et al., prior to World War I, the town had 300 ethnically unspecified households. According to the Patriarchate census figures, prior to World War I, the town had 210 Armenian households or 1,499 inhabitants, as well as 113 Turkish and 75 Kurdish inhabitants. Atrpet reported that the town was evenly split with 200 Armenian and 200 Kurdish and Turkish households. Teodik reported 250 Armenian households prior to the genocide. -The village was situated sixteen kilometers (ten miles) southwest of Liz. Mayewski stated that there were 40 Kurdish households in the village. The village is marked on the map in Bensé’s “Bulanik or Hark” as a locality in Lower Bulanik. Index Anatolicus placed the village two kilometers (1.3 miles) southeast of the Dalik (present-day Aşağıbüklü) village. The other sources used for this study made no mention of a village under such name or a variation of it. -The village was situated northwest of Lake Nazik seven kilometers (four miles) south of Liz. A-Do stated that there were 25 Armenian and 40 Kurdish households in the village. This would place the number of Armenian inhabitants at 200. Mayewski stated that the village was evenly split, with 35 Armenian and 35 Kurdish households. In Martirosian’s updated statistical table, the village had 37 Armenian households or 253 inhabitants and 65 Kurdish households or 361 inhabitants. According to Hakobyan et al., in the early-1900s the village had 200 Armenian and Kurdish households. According to the Patriarchate census figures, prior to World War I, the village had twenty Armenian households or 200 inhabitants and an unspecified number of Kurdish households or 780 inhabitants. Atrpet reported 35 Armenian households prior to the genocide. Teodik reported 30 Armenian households prior to the genocide. -The village was situated on the road from Kop to Bitlis seven kilometers (four miles) southeast of Liz. According to “Msho ashkhar,” Pionk was one of the largest villages in Bulanik in the late-1870s. In A-Do’s account the village was not reported. Mirakhorian identified 60 Armenian and about 30 Kurdish households. Mayewski stated that the village was evenly split, with 50 Armenian and 50 Kurdish households. In Martirosian’s updated statistical table, the village had 55 Armenian households or 527 inhabitants and 60 Kurdish households or 484 inhabitants. According to the Patriarchate census figures, prior to World War I, the village had 80 Armenian households or 457 inhabitants and an unspecified number of Kurdish households or 410 inhabitants. Teodik reported 70 Armenian households prior to the genocide. -The village was situated ten kilometers (six miles) southwest of Liz. According to “Msho ashkhar,” Prkashen was one of the largest villages in Bulanik in the late-1870s. A-Do stated that there were 50 Armenian and 35 Kurdish households in the village. This would place the number of Armenian inhabitants at 400. Mirakhorian stated that there were 40 households, most of which he identified as Armenian. Mayewski listed 50 Armenian and twenty Kurdish households. In Martirosian’s updated statistical table, the village had 80 Armenian households or 593 inhabitants and 25 Kurdish households or 133 inhabitants. According to Hakobyan et al., in the early-1900s, the village had 100 Armenian households. According to the Patriarchate census figures, prior to World War I, the village had 64 Armenian households or 517 inhabitants and an unspecified number of Kurdish households or 65 inhabitants, as well as 46 Turks. Atrpet reported 60 Armenian households prior to the genocide. Teodik reported 60 Armenian households prior to the genocide. An estimate supplied by genocide survivor Ghazar Kirakossian put the number of Armenian households at 74 and the number of Armenian inhabitants at 570. -The village was situated west of the Bilejan mountain thirteen kilometers (eight miles) south of Liz. Mayewski stated that there were 60 Kurdish households in the village. The village was marked on the map in Bensé’s “Bulanik or Hark” as a locality in Lower Bulanik. It also figured on his list of Armenian villages of the Plain of Moush and Bulanik in “Hark: Bulanik county of Moush.” Index Anatolicus identified the village as a locality in Bulanik. Hakobyan et al. placed the village 44 kilometers (27 miles) northeast of the town of Moush. The other sources used for this study made no mention of a village under such name or a variation of it. -The village was situated thirteen kilometers (eight miles) northwest of Liz on the right bank of the Aratsani (Murat) River. Mayewski stated that there were 40 Kurdish households in the village. Lynch described the locality as a little Kurdish village. Hakobyan et al. concurred that in the early-1900s, Kurds inhabited the village predominantly. The other sources used for this study made no mention of a village under such name or a variation of it. -The village was situated on the road from Moush to Manazkert nine kilometers (six miles) northwest of Liz on the right bank of the Lza-get (Vard) River. A-Do stated that there were five Armenian and 45 Kurdish households in the village. This would place the number of Armenian inhabitants at 40. Mirakhorian identified 50 households evenly split, with an equal number of Armenian and Kurdish households. Mayewski listed ten Armenian and 30 Kurdish households. In Martirosian’s updated statistical table, the village had five Armenian households or 43 inhabitants and 75 Kurdish households or 469 inhabitants. According to Hakobyan et al., in the early-1900s, the village had 77 mixed Armenian and Kurdish households, but previously was inhabited entirely by Armenians. Atrpet reported 35 Armenian households prior to the genocide. Teodik reported two Armenian households prior to the genocide. -The village was situated twenty kilometers (twelve miles) southeast of Liz near the northern shore of Lake Nazik. A-Do stated that there were four Armenian and 30 Kurdish households in the village. This would place the number of Armenian inhabitants at 32. Mayewski identified 50 Kurdish households in the village. According to Hakobyan et al., in the early-1900s, the village had 34 mixed Armenian and Kurdish households. In Martirosian’s updated statistical table, the village was not reported. Atrpet reported eleven Armenian households prior to the genocide. H.F.B. Lynch, Armenia: Travels and Studies, volume 2: The Turkish Provinces, London, New York, Longmans, Green, & Co., 1901, pp. 424-425. Vladimir T. Mayewski, Voenno-statisticheskoe opisanie Vanskogo i Bitlisskogo vilayetov [The Military Statistics of the Van and Bitlis Provinces], Tiflis, Caucasus Military District Headquarters Press, 1904, p. 29. Vahakn Dadrian, "The Perversion by Turkish Sources of Russian General Mayewski’s Report on the Turko-Armenian Conflict", in Journal of the Society for Armenian Studies, no. 5. (1991), p. 150. Mshak, nos. 213, 214. September 29-30, 1915. Teodik, Koghkota Trkahai Hogevorakanoutyan yev ir Hotin Aghetali 1915 Tariyin [The Calvary of Ottoman Armenian Clergy and its Flock’s Catastrophic Year of 1915], Tehran, S.N., 2014, pp. 139-141. (in Armenian). Raymond Kévorkian and Paul Paboudjian, Les Arméniens dans l’Empire Ottoman à la veille du génocide [Armenians in the Ottoman Empire on the Eve of the Genocide], Paris, ARHIS, 1992. Raymond Kévorkian, The Armenian Genocide: A Complete History, London, A.R. Mowbray, 2012. See, for example: Hüseyin Kâzım Kadri, Balkanlardan Hicaza: Imparatorlugun Tasfiyesi. 10 Temmuz Inkilâbı ve Netayici, cited in Vahakn Dadrian, Warrant for Genocide: Key Elements of Turko-Armenian Conflict, Transaction Publishers, 2003, p. 173; Robert Tatoyan, The Question of Western Armenian Population Number in 1878-1914, Yerevan, The Armenian Genocide Museum-Institute Press, 2015; and Jelle Verheij, Diyarbekir and the Armenian Crisis of 1895, Koninklijke Brill NV, 2012, p. 88, for a more in-depth discussion of this point of view. Kemal Karpat, Ottoman Population, 1830-1914: Demographic and Social Characteristics, Madison, The University of Wisconsin Press, 1985, p. 174. Ahmet Tetik (ed. ), Armenian Activities in the Archive Documents, 1914-1918, Ankara, Genelkurmay Basım Evi, 2005, volume 1, p. 163. Massis, February 5 (17), 1881. Mayewski, op. cit., p. 26. Luma, chapter 1. (1897), p. 167. Okcu and Akdağ, op. cit., pp. 205, 317, 442. Vital Cuinet, La Turquie d’Asie: géographie administrative, statistique, descriptive et raisonée de chaque province de l’Asie-Mineure, volume 2, Paris, 1891, p. 588. Dadrian, op. cit, pp. 140, 150. Justin McCarthy, Muslims and Minorities: The Population of Ottoman Anatolia and the End of the Empire, New York, New York University Press, 1983, p. 71. Dadrian, op. cit., pp. 139, 146. Mayewski, op. cit., pp. 199-206. Marcel Léart (alias Krikor Zohrab), La question Armenienne a la lumière des documents [The Armenian Question in the Light of the Documents], Paris, Augustin Challamel, 1913, p. 60. Karpat, op. cit., pp. 188. Bensé, Bulanik or Hark, p. 35. Inclosure in No. 25. Consul Taylor to the Earl of Clarendon. Erzeroom, March 19, 1869. Turkey No 16 (1877), pp. 16-36, No. 13/1. Lumá, chapter 1, p. 167. Bensé. Bulanik or Harkʿ, p. 35. Mayewski, op. cit., p. 220. Martirosian, op. cit., p. 7. Kévorkian, op. cit., p. 350. Mshak, no. 92. August 16, 1890.